Turnkey’s clients include organizations like Church World Service and UNICEF, groups that address humanitarian crises around the world. We never expected to be confronted by a humanitarian crisis unfolding in our own home, on the southern border of the U.S. One created by our government. So far, nearly more than 2,300 children have been separated from their parents who presented themselves to the U.S. Border Patrol seeking asylum. These families are being treated like enemy combatants. At the rate they are being taken, by August there may be 30,000 children in U.S. custody. Yesterday, at a tent city in Texas, the government constructed to house some of these children; the temperature reached 105°F. The Trump administration has chosen to weaponize immigration, assaulting the moral values of our society. There are a certain number of Americans, probably 30 or 35 percent, who will defend this policy as necessary. If you are among them, we won’t try to convince you that what is happening is immoral and, fundamentally, un-American. Neither will we castigate you for your beliefs. This view is held by some members of our own family, whom we know to be good and decent people. We’re not experts in immigration policy. But, the immigrants we know are among the finest people we have ever met. And although there has been a consistent attempt to characterize undocumented immigrants as “rapists, thieves and murderers,” studies have shown that they are far less likely to commit crimes than American citizens. Undocumented immigrants also contribute $12 billion a year in taxes, paying an effective tax rate that is higher than America’s top earners, 8 percent versus 5.4 percent. We’re not even going to mention the fact that a taco truck serving Hispanic food on every corner would be a great thing. So not to speak out however we can and condemn this shameful, “zero-tolerance” policy as immoral would be wrong. All societies have their own social norms, their mostly unspoken rules and shared beliefs. Social psychologists have documented the tremendous power of social norms to govern our decisions and behaviors, whether we are aware of them or not. Not to speak out gives credence to the idea that what is happening is acceptable. That it is something that we tolerate, even embrace. The nonprofit community occupies a special place in our society. We are in the business of recruiting and welcoming others into the service of the greater good. We know that supporting our missions often results in our constituents becoming their best selves. Because people trust us (nonprofits) to promote the greater good, we also have the responsibility to speak out when we see that which erodes it. Immigration is a political issue. The humane treatment of children is a moral one, and that is why we must put an end to the zero-tolerance policy immediately. Not to say as much would be a violation of our constituents’ trust. Finally, like all good fundraisers, we must include a call-to-action. 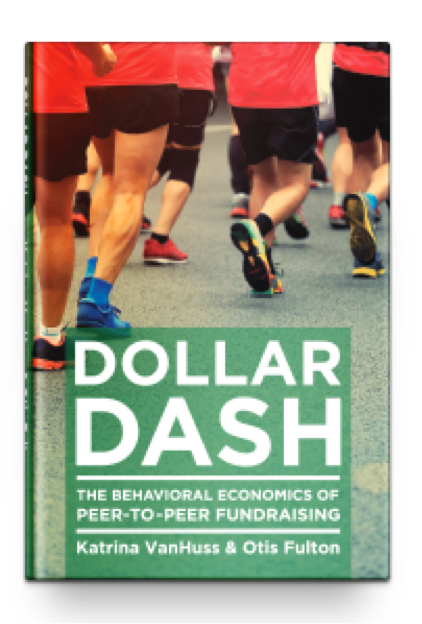 Katrina VanHuss and Otis Fulton have written a new book, Dollar Dash, on the psychology of peer-to-peer fundraising. Click here to download the first chapter, courtesy of NonProfit PRO!